WASHINGTON (AFP) ― When stars explode, it’s a messy business. But the massive blasts are also useful, seeding the universe with such key elements as calcium, iron and titanium. And with the help of a new high-energy X-ray telescope, NASA said astronomers are closer than ever to seeing just what’s going on. “This is helping us untangle the mystery surrounding how stars explode,” said Fiona Harrison, principal investigator on NuSTAR, or the Nuclear Spectroscopic Telescope Array. Combined with images from another NASA X-ray observatory, Chandra, NuSTAR has created the “first ever map of radioactive material in the remnants of a star that exploded,” she told reporters. One of the biggest surprises was that stars, which are spherical objects, do not explode in a circular manner, she said. Rather, it appears that the blast is more lumpy and distorted from the very beginning. “Prior to the explosion, the core of the star literally sloshed about,” said Harrison, a scientist at the California Institute of Technology. 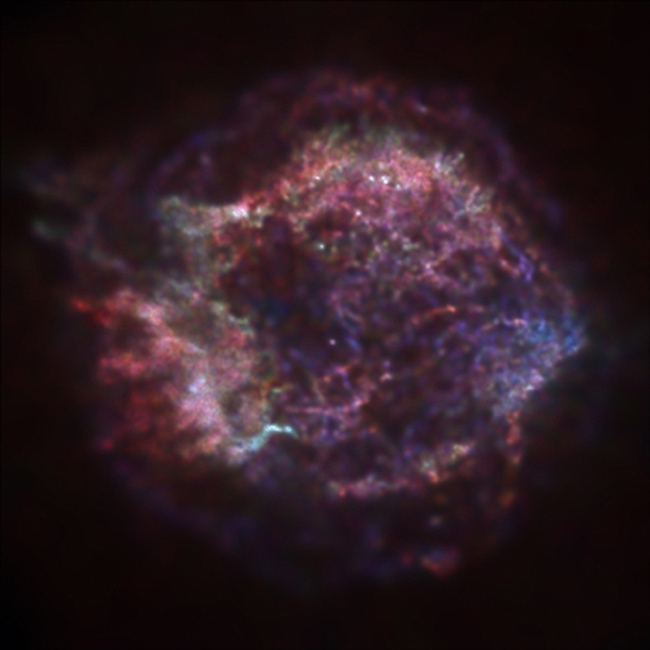 Astronomers based their findings on the observations of Cassiopeia A, or Cas A for short, a remnant of a supernova 11,000 light years away. The star exploded about 350 years ago, blowing off outer layers with an extreme heat that created even more elements. Cas A has been expanding since the year 1670, propelling debris at a speed of 20,000 km per hour, but never before have scientists been able to glimpse the radioactivity that was produced inside the explosion. “With NuSTAR, we have a new forensic tool to investigate the ashes left behind when this star exploded,” said Brian Grefenstette, an astronomer at Caltech. NuSTAR launched in 2012 on a two-year mission, joining the NASA fleet that also includes the Hubble Space Telescope. It is the first orbiting telescope to focus on the high-energy X-rays of the electromagnetic spectrum. Although the Chandra Observatory remains the world’s most powerful X-ray telescope, NuSTAR can monitor a range the older orbiting telescope can’t see. “You should care about this,” said Kirshner, who was not involved in the project.